Last week I attended Dots' spring/summer fashions style party. I walked in the door and was handed a cute little bottle of champagne with a pink straw in it. I received a tour of the store highlighting the new collections. After that I had a fabulous time playing around in a very big closet. I tried on almost everything and modeled them for the staff. That's what an itty bitty bottle of champagne will do to you! I also posed for pictures however I didn't take any on my camera. I only have the one below taken with my phone. The capri pants are really flattering. I usually stay away from capris because they look like pants on my short legs but these really worked for me. The lines made my legs look longer. The capris came home with me! Check out the trendbook to to see more pics of the pieces styled up. I wore the shoes yesterday. They're great for taking it up a notch while baby wrangling. 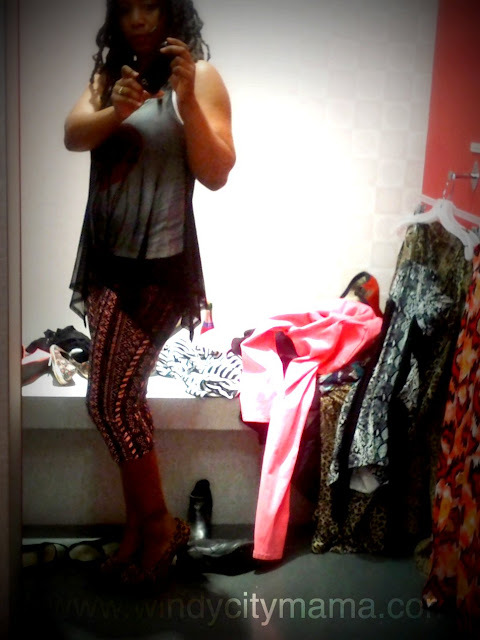 The tribal print capris are really cute and comfortable. I also bought a chevron print maxi dress. Hopefully we'll finally hit 80 degrees this week so i can wear it. I bought nail polish and stickers too. No pictures though. Why yes I did take take a couple of cupcakes and champagne out the door. Are you a Dots fan? Have you purchased anything from the Spring or Summer collection? sounds like a great party. We don't have this brand in our country but I like the style, some of my favorites includes the floral shoes, printed pants and colored jeans. So on trend ! Seems like such a cool event...Neons are definitively trendy this year. I dont think we have a Dots in my area. I would love the orange and white top you took a pic of though :) Sounds like you had a great time. Sounds like a fun time. I haven't been to dots in ages. I might have to pay them a visit soon. Yes it's a very budget friendly trendy brand over here. I hadn't shopped there in quite some time (thrifting and all), I was pleasantly surprised at how cute and inexpensive everything was. It was so much fun. Champagne, cupcakes, and shopping. Yes, please. Dots is online too! Same here. I thought it would all be juniors clothing but there were some things that were appropriate for my non junior size. i need some of that while thrifting....hmmm wonder if I can make it happen.